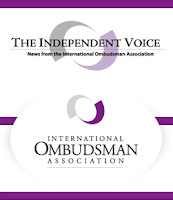 This is a copy of a paper published in The Independent Voice, the newsletter of the International Ombudsman Association, May 2017. Please cite as: Deflem, Mathieu. 2017. "The Ombuds and Social Control." The Independent Voice, IOA newsletter, May 2017. It is too easy to state, unequivocally, that the ombuds is an agent of social control, as much as it would be erroneous to deny that this can be the case. Arguments to define and analyze the functions of ombuds professionals are often made, as they should, for they show the reflexive nature of the expertise of the ombuds. Simply put, it is part of the job of the ombuds to constantly define and re(de)fine the role. As a sociologist, it is gratifying to observe that the concept of social control has from time to time informed discussions on the ombuds role and other professionals in positions of responsibility towards others (doctors, priests, teachers, social workers), even when the centrality of the concept in the discipline is no longer undisputed. Developments in sociology have been such that certain specialties have moved towards new domains, so that issues of social control are today mostly researched as aspects of criminal justice. Yet, the uniquely sociological orientation to social control remains a useful lens through which various professionals can examine their role and position. Among the dynamics of social control, sociologists have explored the relative independence agents of social control come to enjoy when they professionalize their position on the basis of acquired expertise, involving both relevant knowledge (of problems to be addressed) and technical know-how (of how to address them). This autonomy of social control agents creates opportunities to tackle problems of norm violation in highly efficient ways, but also presents special difficulties, especially when social control practices lack necessary oversight to abide by all due legal and ethical requirements. No easy lessons can be drawn from these general observations for the practicing ombuds. But to the extent that ombuds professionals find themselves in a situation that involves dynamics (other) agents of social control face, they should, at a minimum, continually reflect on the special duality of their activities relative to the organization in which they are employed and the people they are meant to serve. It cannot suffice for any self-respecting ombuds to merely point out that theirs is the position of a designated neutral who is independent in the organization. Expertise to deal with matters as efficiently as possible will need to be harmonized with an informed accountability to do what is right. In practice, this responsibility will mean that ombuds professionals continually navigate their roles in, not for, their institutions. Or, as a wise man once said, commitment can best be reserved for principles rather than any institution. After all, those who are committed to an institution should be subject to social control rather than serve as agents thereof. Deflem, Mathieu. 2015. "Deviance and Social Control." Pp. 30-44 in The Handbook of Deviance, edited by Erich Goode. Malden, MA: Wiley-Blackwell. See related writings on academe and social control. "ombudsman and social control"